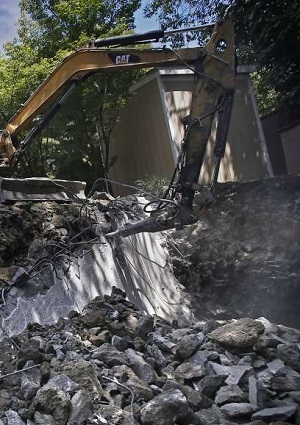 Rock Hammer Demolition Swimming Pool Removal Questions Answered Here! It’s swimming pool removal time. You have had it. You’re finally going to do it. This time you mean business. That’s right, the swimming pool is going bye bye. There are many reasons to remove a swimming pool. However the one I hear almost every time is…. the pool is older and requires upgrades and repairs. 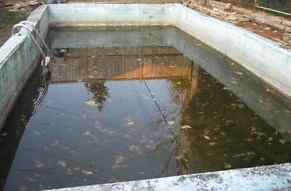 The repairs are costly and, to top it all off, the pool is rarely used. I understand; why make a costly investment in something that is rarely used. Besides a vegetable garden in the same spot is something you have always dreamed of. No wait – that’s what I told my wife I wanted in place of our pool ?? Okay, back to your project. So where do you start? Your swimming pool removal project does not have to stress you out. You probably have tons of questions. Don’t worry. I am here to hopefully answer most of them. You have two options when it comes to swimming pool removal. You can have it removed completely then backfilled or you can have it partially demolished and backfilled. Total Swimming pool removal is just that, total. The entire pool and all its components will be completely removed. Items removed include all swimming pool equipment and pool deck (unless reuse is possible), all swimming pool or hot tub plumbing, electrical conduit, all concrete, re bar and tile – all of it gone. Finally, the entire space is backfilled to code. More on that later. The most important aspect to consider with total swimming pool removal is cost. 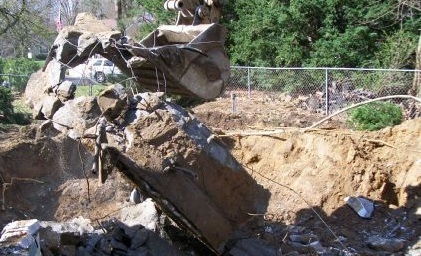 Removing all concrete, re bar and debris will cost more to dispose of than a partial removal and backfill. In addition, the more of the pool that is removed, the more backfill material will be required in the end. Finally, removing all aspects of your swimming pool system will take more labor hours to accomplish. All of this equals a higher cost to the home owner. On average total swimming pool removal costs about double of what partial swimming pool removal will cost. For this reason most homeowners go with option number two, partial swimming pool removal and backfill. Complete removal does have its place however. Some clients are looking to replace their existing pool with an new one in the same location. Partial swimming pool removal is removing only certain aspects of the swimming pool and surrounding structures then backfilling. All the visible structures of swimming pool are demolished and the entire site is then backfilled leaving the site looking just like a total removal in all aspects. Partial swimming pool removal will include, breaking and demolishing the top 24 inches down the inside side of the swimming pool including coping. Stairs are demolished completely. Swimming pool deck is demolished. Concrete spoils can be used as backfill if the pieces are broken into small enough segments. Larger segments are sent to the concrete recycling yard. All steel exposed during demo must be cut flush and moved off site for disposal. Ensuring proper water drainage is vital after backfill and completion of project and must be addressed during the demolition process. Holes must be broken through the pool bottom at least 6 inches in diameter. Holes should be evenly distributed throughout the shallow and the deep end of the pool. Holes will be filled in with gravel before final backfill. These holes allow water to flow through to the soil beneath the pool bottom. Proper drainage prevents lifting from occurring in the future and allows for proper ground saturation in wet weather. At this point the pool must be inspected by the local city inspector to ensure all work is done to code and is ready for backfill. The final step in swimming pool removal is backfilling the site. The pool is backfilled with fill dirt and rock. The first layer of dirt at 36 inches is followed by water and a layer of rock at 36 inches followed by more water. This dirt, rock, water layering process continues up to 12 inches from the finished surface. The last top 36 inches of backfill must be compacted to 90%. Soils test are completed at this point to verify compaction. The final 12 inches of backfill must be done with clean top soil back to yard or concrete level. There are many things to consider before you get your swimming pool removal project underway. Swimming pool removal requires the use of some heavy equipment. Skid steer loaders with hydraulic hammers or excavators with hydraulic hammers are used to do the breaking, loading out of debris, backfilling and grading. Access to the work area is consideration numero uno. On average, equipment that is utilized to demolish a swimming pool will weigh between 5000 to 12000 lbs. and require a clear path to access the back yard. 7 feet wide is preferred, however smaller equipment can by utilized as well. Do you have a clear path of travel to the work area? Is the work space confined? Will a fence or wall need to be taken down? Are there any trees prohibiting access? We offer other demolition services to solve any other problems you may face. Underground septic tanks? Where are they located? It is best to avoid moving heavy equipment over any septic tank systems. Whatever the obstacle we can overcome it and make you project a success. Other things to consider. A permit is required. Will you pull the permit or will the contractor take care of this for you? Will the contractor ensure a properly cleaned site once complete? Broom swept or pressure washed? Get exact details on what the final condition of the site will be so there are no surprises at the end. What is clean to you and what is clean to a contractor might be two different things. With a little knowledge, you too can ensure a smooth and painless swimming pool removal project. Now get to it. Have any more questions or concerns we are here to help. 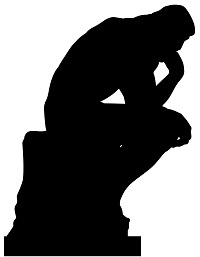 Click here and we will get back to you with the answers you need right away.